Wherein I find I don't know what I thought I knew. A portrait of Charles Collins from Ben Hecht's book, A Child of the Century. He was a mainstay of Chicago's newspaper world from the 1920s to the early 60s and a good friend of Vincent Starrett. He was also one of the four Founding Fathers of the Hounds of the Baskerville (sic). Charles William Collins was born in Madison, Indiana on Nov. 19, 1880. His family moved to Chicago when he was four. He graduated from the University of Chicago and worked for several newspapers before landing a gig at the Chicago Tribune as a theater critic and later a columnist. For nearly two decades, Collins oversaw the popular column "A Line O' Type or Two." Funny and folksy, the column was one of the most popular features of the newspaper before, during and after his tenure as editor. While many of the briefs that made up the column were sent in by readers, it was Collins' sensibility that set the tone for the daily column. Less well known was a second column he edited, "Bookman's Holiday." It's this column that we're going to talk about today because it was there that the most beloved poem in the Sherlockian world had its public premiere. But first, a little background on the publication history of the poem. 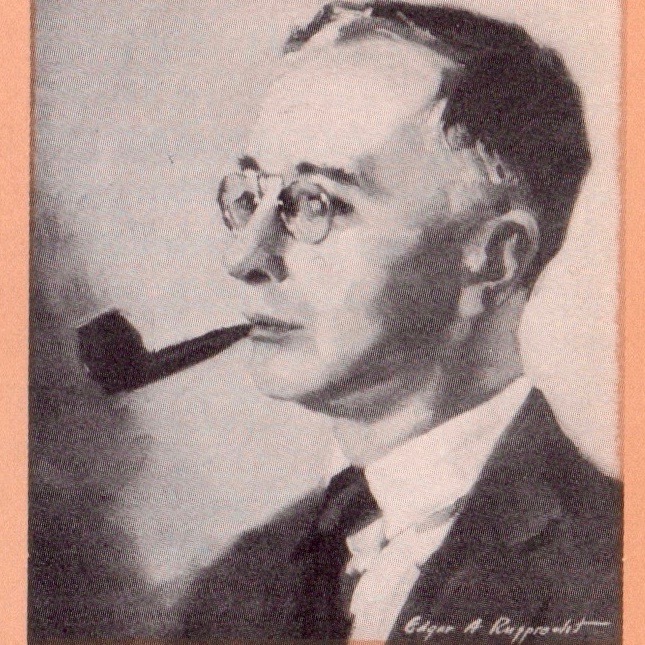 Starrett's sonnet was written on March 11, 1942 and dedicated to Edgar W. Smith, leader of the Baker Street Irregulars. 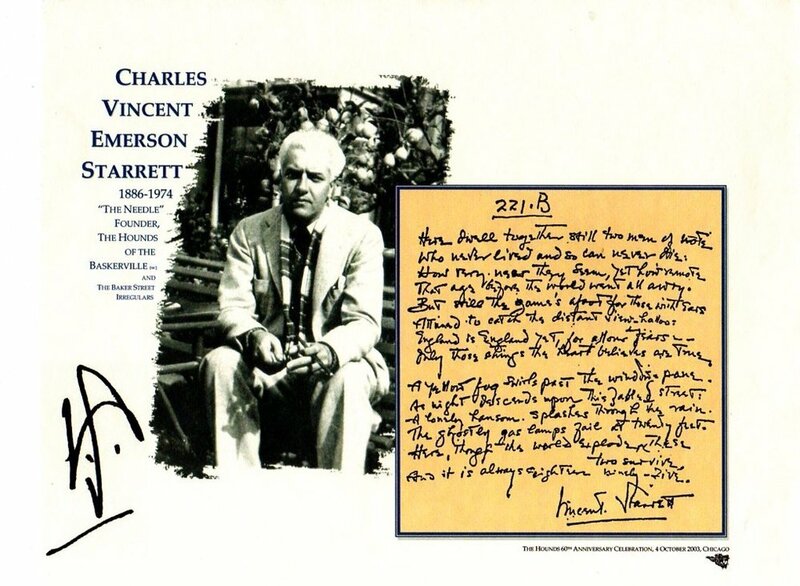 He sent the sonnet to friends, including Smith and Christopher Morley. Private publication as a Christmas card with Morley's poem "Sonnet on Baker Street" came next. The Christmas card was printed in November 1942 by Starrett's friend, Edwin B. Hill, in a limited edition of 60 copies. The card was sent to friends and Collins, as we'll see, was one of the recipients. From there, it went on to other publications like 221B: Studies in Sherlock Holmes and a permanent spot on many scion society programs. That was the order I've been certain of and reporting on for decades. While researching the history of the Hounds of the Baskerville (sic) for their 75th anniversary on Oct. 6, I was surprised to see that Collins had talked about the poem in his column, "Bookman's Holiday." Here's how Collins told his readers about "221B." I have no idea how those coffee stains got on this book's dust jacket. The first public printing of Vincent Starrett's sonnet, "221B" from the Chicago Tribune for Jan. 3, 1943. Charles Collins edited "Bookman's Holiday" for the Tribune. And as you can see, Collins does just that. This was the first public printing of the poem, but it would not be the last for Chicago's Hounds. Whether he knew it or not, Collins started a tradition that Hounds have been keeping up ever since. For each year's dinner, Hounds have produced a beautiful version of Starrett's poem. I don't know how long the tradition has being going on, but I can tell you that no other Sherlock Holmes group in the world has revered this poem so deeply and for so long, as the Hounds. They are the true keepers of the "221B" flame. And Charles Collins started it all. NB: Claiming that you've found something that others have missed in the Starrett world is a risky claim to make. There have been so many others who have tread this path before me that I can't help but wonder if I'm not the first. So if you know of a publication where this is noted, please let me know. One of the beautiful reproductions of "221B" produced by the Hounds of the Baskerville over the years. This one was distributed at the 2003 Hounds dinner. I've used it periodically as the cover photo for the Studies in Starrett FaceBook page.